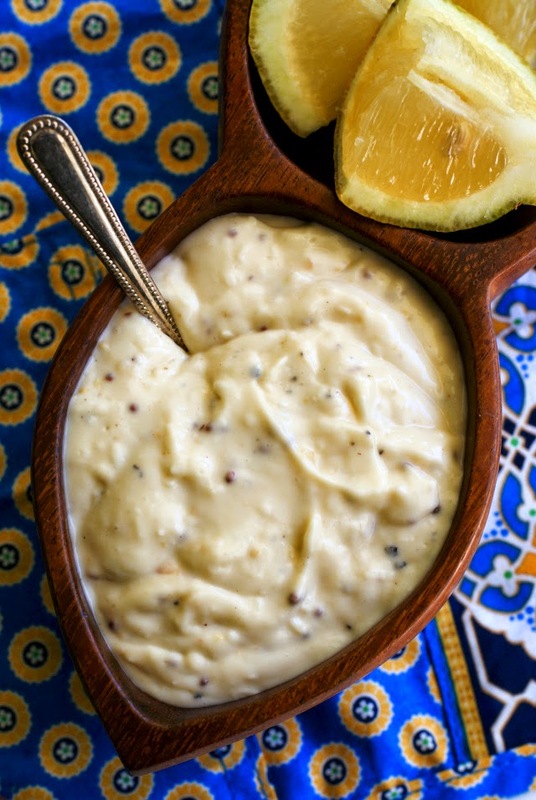 Roasted Garlic Aioli, made with slow-roasted garlic, fresh lemon juice, pecorino romano cheese, and whole grain mustard, is the perfect creamy condiment for spreading on sandwiches or pairing with seafood. Today was one of those days where my husband and I decided to turn to the pantry and fridge to decide what was going to be on the menu for dinner tonight. We need to do some grocery shopping, but neither one of us really felt like going out today, so there you go. Eat what you got. My husband is a meat and potatoes kind of guy, so nights like these are a little tough for him because, well, we're out of meat and potatoes. When I opened the fridge, I saw that we still have some fresh tomatoes and a half a head of lettuce. Then, I found some bacon in the freezer. Now, if you saw those three ingredients, I know that you'd be thinking exactly what I was thinking...BLT's. I love me a nice BLT (short for bacon, lettuce and tomato sandwich) with a side of wavy potato chips. Simple all-American cuisine. Only one problem. Yep, you guessed it...the hubs. That is a lunch dish, in his opinion. To be honest, I could eat a bowl of cereal for dinner, so his pickiness is a little ridic to me, but it is what it is. He likes what he likes. I had to put a little spin on the BLT's to make them dinner-worthy for him. Adding something as simple as this homemade Roasted Garlic Aioli transforms this meal into dinner in his eyes. Men are mysterious creatures, I tell ya. Roasted Garlic Aioli: spread it on a sandwich, use some chips for dipping, or serve it as a seafood accompaniment. Seriously, so versatile and so delicious! Preheat your oven to 425 degrees. Cut 1/4 inch off of the heads of garlic to expose the cloves. Drizzle lightly with olive oil and sprinkle with salt and pepper. 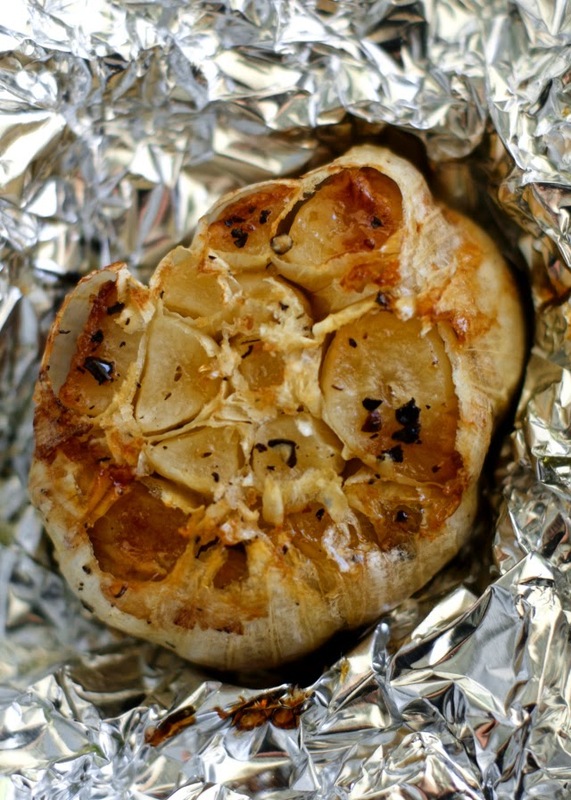 Wrap the heads of garlic in foil and roast for 40 minutes. Remove from the oven to cool. When cool, squeeze the garlic from the skins into a medium bowl. Add the remaining ingredients to the garlic and whisk everything together until well combined. Cover and refrigerate for 30 minutes. Use as a dip or spread. For a smoother aioli, process in your food processor until smooth. 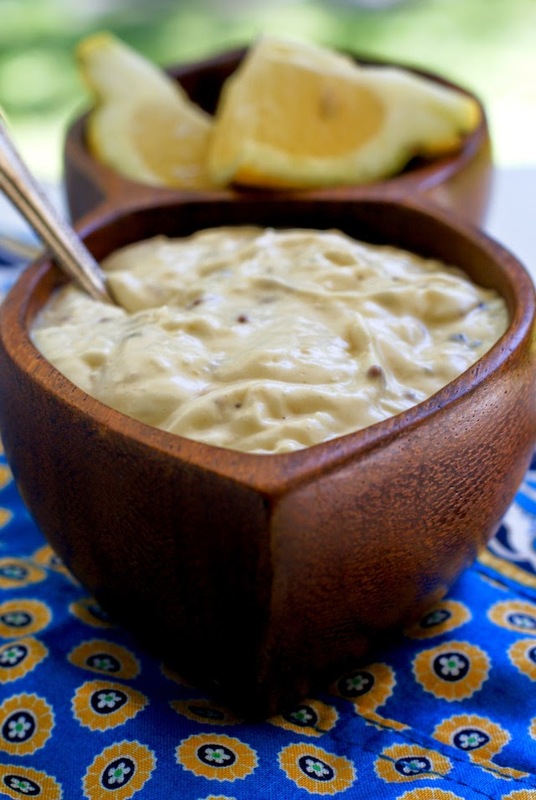 Dijon mustard can be substituted for the whole grain mustard if that's what you have! Source: Adapted from Guy Fieri.